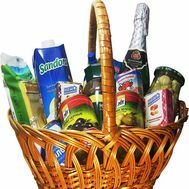 A basket with products will become a useful and proper investment of funds for any of the holidays. 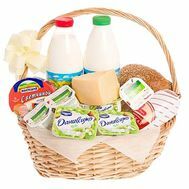 As a rule, such a gift is given in the family circle, especially on winter holidays, when takes time to buy. 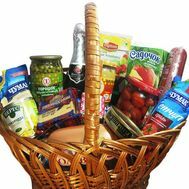 At such a moment, the festive basket of products will perfectly help you and please the recipient, showing him in all its glory your ingenuity and care! Beautifully designed by the best specialists, she will emphasize the importance of relationships in the family, friendships and even company-like office relationships. 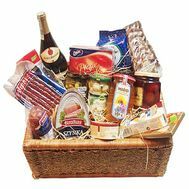 Such a gift will bring a lot of joy to its recipients on any day. 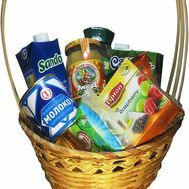 Not only beautiful, but also useful, this basket will give unforgettable emotions from tasting each product. 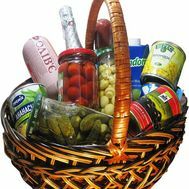 A basket of useful products for a woman: the most useful and necessary gift, especially if you give it to his wife for New Year's holidays or Christmas. 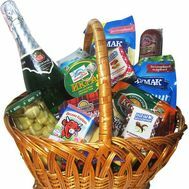 This is also an original birthday gift to the grandmother, who will find use for all products in the basket. 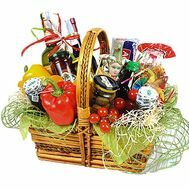 A basket of food for a gift is not only an unusual surprise that is not expected, but also a caring gesture of attention. 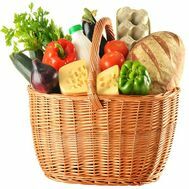 It will fit on holidays, when not everyone has time to run after groceries. 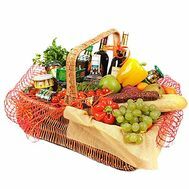 And, besides, with her help you will surprise native people and give them a festive mood. 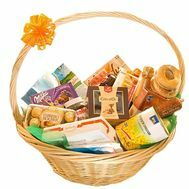 Where to buy a basket of products in Ukraine? 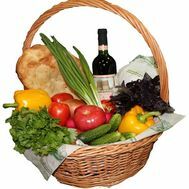 We are a store that has more than 10 years experience with flowers and compositions. 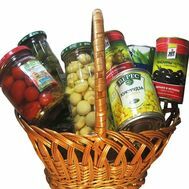 With us - it is profitable, because we provide 100% quality assurance of products that will be in the basket, as well as timely delivery of each order. 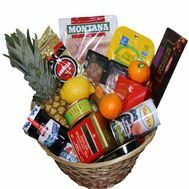 And our store often conducts various promotions and discounts to regular customers. 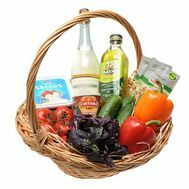 Also, we can offer you many payment methods, so you can buy without leaving your home. 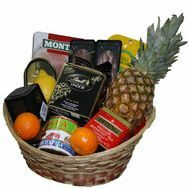 It is enough to place an order - and our delivery service will do the rest for you. 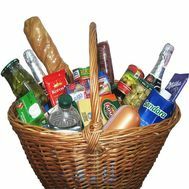 Our courier will bring the basket to wherever you need, at any address you specify. 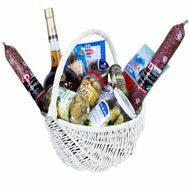 Comments about our work and photo deliveries from our store you can easily see in the necessary section on the site. After all, we do everything to make every interested person our new happy client!